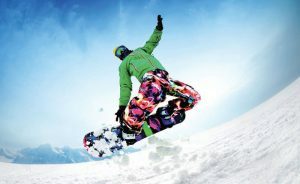 Switzerland-based Sensient Imaging Technologies recently introduced ElvaJet® Opal SB inks formulated for low-viscosity Epson® printheads, which offer digital dye sublimation performance in terms of color and sharpness. 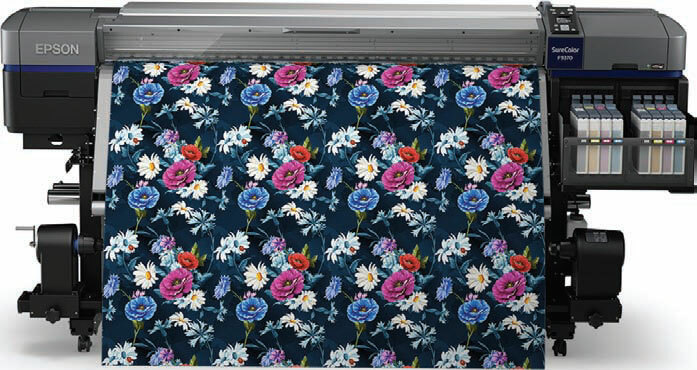 A look at some of the new technologies entering the digital textile printing market. InPrint USA, to be held April 9-11, 2019, in Louisville, Ky., will once again be collocated with the International Converting Exhibition USA (ICE). InPrint will highlight exhibits from industry suppliers that service the functional, decorative, and package printing market. InPrint/ICE attendance will be highly beneficial to companies wishing to keep abreast of the newest technologies and to learn best practices in the complex operations of inkjet printing for plastics, metals, woods, glass, ceramics, and textiles, in market sectors such as apparel, automotive, furnishing and interior décor, labels, signs and banners, and packaging. InPrint USA 2019 will partner with two major trade organizations; The Wallcoverings Association (WA) and the Flexible Packaging Association (FPA). For both the packaging and wall décor market, inkjet printing has the capability of meeting consumers’ demand for higher print quality, increased number of colors and faster response to market trends. In addition, digital printing enables customized prints and has the unique advantage of enabling color and design cohesiveness across multiple substrates. So for example, businesses such as boutique hotels, wishing to offer residents a lifestyle experience, can coordinate the print décor of ceramic, wood, and carpet flooring, with wall and window coverings, bedding and even packaging of personal care items. Round table participants at the 2018 InPrint conference felt that décor — including textiles, flooring, and wallcoverings — and packaging are the two segments that provide immediate growth opportunities. According to Boston-based I.T. Strategies, research consultants for the digital print community, wallcoverings saw more than $100 million in revenue in 2017, and is one of the many fast-growing sectors within industrial printing. To support the décor print market, a number of new colorant and machinery developments will be showcased that are worth investigation. Switzerland-based Sensient Imaging Technologies, a subsidiary of Milwaukee-based Sensient Technologies Corp., recently introduced ElvaJet® Opal SB inks formulated for low-viscosity Epson® printheads. ElvaJet Opal SC inks for mid-viscosity print heads, such as Kyocera, were launched in 2018 and were awarded the ECO PASSPORT by OEKO-TEX® certification, a certification now also achieved by the ElvaJet Opal SB inks. Both the ElvaJet Opal SB and SC inks offer exceptional digital dye sublimation performance in terms of color, sharpness, and superior release from coated and uncoated transfer papers as low as 18 grams per square meter in weight, according to the company. The Colaris series of printers from Zimmer Austria Inc. are compatible with a variety of colorants including reactive, disperse, acid, pigment and vat. Austria-based Zimmer Austria Inc. is a producer of machines for textile and carpet finishing. For special applications that require colorant penetration through the substrate such as carpeting, terry towels, flags, and plush, or heavy automotive and home décor fabrics, Zimmer offers the Colaris3 high-performance pre-treatment, digital printing, and colorant systems. 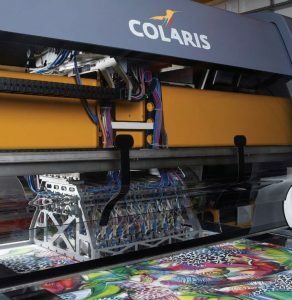 The Colaris series of printers can be used with a variety of colorants such as reactive, disperse, acid, pigment, and vat. Inline pre- and post-treatment systems can be added to improve print quality and increase ink penetration. 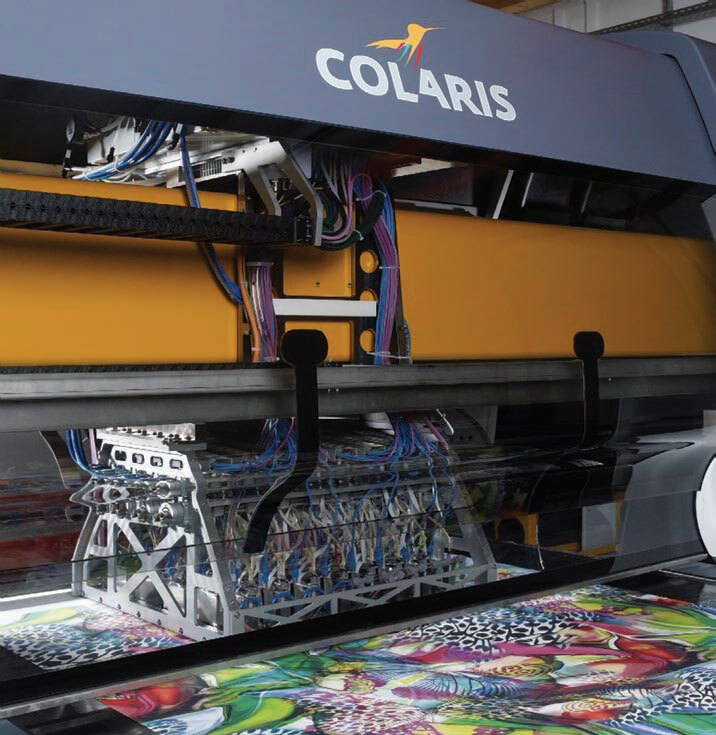 The Colaris3 printers can be configured with up to 96 StarFire™ SG1024 compact industrial printheads. Developed by Tokyo-based Fujifilm, the StarFire SG1024 printhead is available in three models for Colaris3 printers, each with varying drop size capability — the SA model is intended for printing light- and medium-weight home decor, apparel, and flag substrates that can achieve ink penetration with drop sizes ranging from 12 to 35 picoliters; the MA model has capability of 30 to 75 picoliter drops and is best suited for medium-weight carpets velours, terry cloth and low to medium plush piles; and the LA model printhead is capable of 75 to 180 picoliter drop sizes for ink penetration of voluminous substrates such as heavier weight carpet, furs, and plush blankets. The StarFire SG1024 printhead is a compact, self-contained unit built to withstand demanding industrial textile and other applications. The life of the printhead is extended because of the replaceable coated metal nozzle plate and continuous ink recirculation with RediJet™. The printhead is compatible with solvent, ultraviolet-curable and aqueous ink formulations. The Epson Group, led by Japan-based Seiko Epson Corp., has taken a whole system approach with the Epson SureColor F9370 Dye-sublimation Inkjet Printer. The machine offers industrial-level production speeds up to 1,169 square feet per hour and is equipped with dual PrecisionCore® TFP® printheads. The PrecisionCore print chips are based on micro-electro-mechanical systems (MEMS) technology, which uses a 1-micron-thin piezo actuator that acts like a pump to deposit ink. The ability to pump larger amounts of fluid through densely packed nozzles yields a multitude of small, round, precise dots ensuring a high print quality when reaching high print speeds. The UltraChrome® DS with High-Density Black dye sublimation inks, combined with the included Wasatch® SoftRIP® TX SureColor F9370 Edition softwear from Salt Lake City-based Wasatch Computer Technology, ensures a large color gamut and high color quality. chosen swatches then may be entered into SoftRIP or saved to a Wasatch Color Database. Color Neighborhood Analyzer — to specify a spot color and create a targeted 100-patch test pattern centered on that color. Color Database — enables the user to maintain a list of saved and frequently used colors. The color chosen from the Color Database can be routed through ICC management or directly to print heads, depending on workflow needs. Single pass printers, capable of printing up to 70 meters per minute (m/min) when set with a CMYK colorant system, now surpass speeds of rotary screen printing. Unlike scan-type printers, single pass printhead systems print on the substrate as the fabric is fed under a fixed print unit. 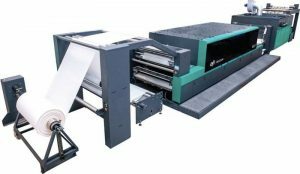 IT-Strategies reported that in 2017, the Lario printer manufactured by Italy-based MS Printing Solutions S.r.l., was installed in more locations that any other single pass printers. New to this market, and introduced in late 2018, the EFI™ Reggiani BOLT, can reach speeds of 90 m/min. Unique to this system is a proprietary technology for combining digital and rotary techniques for hybrid solutions. One or more analog printing stations, which may be easily connected as an optional feature, can be integrated into the digital printer for special effects or spot colors. The robust recirculating printhead has been developed in partnership with a leading printhead manufacturer and will be available exclusively to EFI Reggiani. With drop sizes ranging from 5 to 30 picoliters, the Bolt is capable of high-quality grayscale images. The year 2019 may prove to be a game changer for digital printing as companies continue to specialize and provide innovative solutions for increased flexibility and speed to market.